If you're looking to avoid the usual post-meal discussions that can vary from tedium to full-scale political arguments, you could just hide, but another good choice is to get everyone involved in an activity that draws their attention. 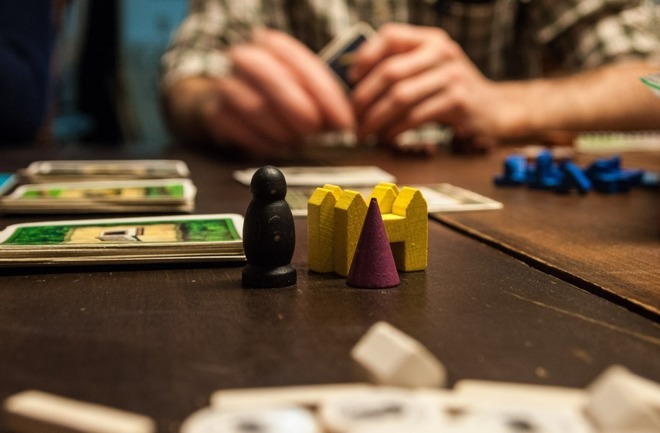 While board games are certainly one way to accomplish this, getting hold of the digital equivalent can get everyone up and playing a game in a short period of time, without having to explain "house rules" to new players. "Ticket to Ride" ($5.99) from Asmodee Digital is an adaptation of the classic board game, tasking players with connecting cities across a map with their own railway, while simultaneously thwarting their opponent's efforts. Like the physical equivalent, each player can place their own colored train pieces to claim routes between cities across the United States, though other maps can also be acquired and played with via in-app purchases. Along with the Pass and Play mode, which supports up to five players on one screen, the game also includes cross-platform play, allowing users to take on others online with asynchronous gameplay, as well as against AI opponents. "Catan Classic HD" ($4.99) is the iOS port of the well-known board game Settlers of Catan, where players trade resources with each other to build roads and settlements on a random tile-based game board. As you would expect, it uses the original rule set and can be played by up to four people on the same device, but it has the advantages such as the game handling duties such as counting victory points for the players, and eliminating the fiddly game pieces altogether. Aside from the main game, there are also the "Seafarers" and "Cities and Knights" expansions available as in-app purchases, giving more variation to the basic gameplay. Online battles and AI gameplay is provided for amusement away from the family, with it also offering up gameplay statistics and three graphic sets to change its appearance. A more modern option, "Exploding Kittens" ($1.99) is the iOS version of the cuddly and somewhat family unfriendly card game, illustrated by The Oatmeal's Matthew Inman. Playable by up to five people across multiple devices, players must draw cards from the top of the deck and hope not to pick up the titular Exploding Kitten, which ends the game for them if they cannot play a Defuse card. Rather than being a game of chance, players can pick up a variety of other cards that can be used against their opponents, such as to miss a turn or to force another to draw multiple cards. As it is played on multiple devices, each player gets to see just their own cards, keeping others from easily knowing what could be used on them in the future, though this does mean all players need to buy the game for themselves. The fourth in the series, the "Jackbox Party Pack 4" ($24.99) includes five different games that rely on players to select or create their own answers to questions, or to draw something. The games include the truth-seeking Fibbage 3, the speed dating-based Monster Seeking Monster, and the artistic Civic Doodle. The games themselves are displayed on an iPad or an Apple TV for everyone to see, but answers are entered by other devices. Games provide a code that need to be entered in the Jackbox website through the player's browser on an iPhone, iPad, or a desktop browser, meaning that the game only needs to be bought once, but everyone can take part using their own hardware. There are those gatherings, that you just have to make yourself scarce. "Ticket to Ride" and "Settlers of Catan" have good single-player modes, but there's always media consumption. Apple's iBooks app is... adequate. There are better solutions, depending on your media of choice. Apple's iBook Store is very good, though. The iBooks app functions as a rudimentary Epub and PDF reader, with deep integration into Apple's book store —so for simplicity it can't be beat. If you want to stick entirely with Apple's ecosystem, you can stop reading now —you've got enough in the palm of your hand to successfully hide until the blissful release of Sunday travel. However, there are a few apps to use other book stores, read all the magazines you want, and open just about any media file you want. Amazon and Apple haven't always been the best of friends. But, Amazon has always made sure that ebook purchases from the Kindle library have been accessible on the iPhone and iPad. 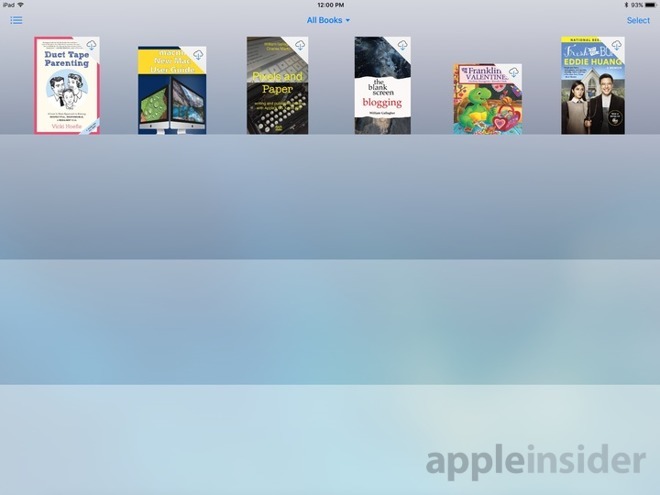 What iBooks is to the Apple bookstore, the Kindle app is to Amazon's offerings. While the offerings store to store are about the same, truth be told, the sales on Amazon's stores have been a bit better over time. Plus, Amazon has Kindle Unlimited, a $9.99 a month service that allows a good portion of Amazon's library to be read without purchasing the book. Apple doesn't have anything like that, so if you're a devout reader, Amazon is the place to go. 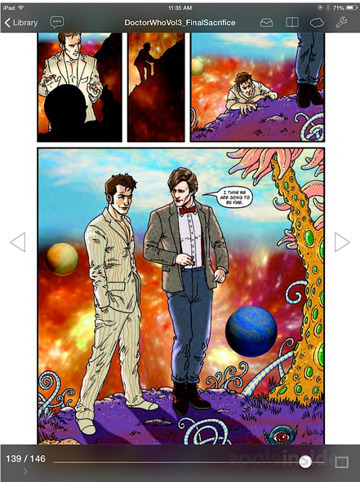 Also from Amazon, comic fans can use Comixology Unlimited, either as a reader or as a subscription service. It's not the best reader we've seen —which we'll talk about a bit later —but it is the only game in town if you're using the $5.99 a month all-you-can-read service. Not everything is available on Amazon, or Apple's iBooks Store. Plus, the PDF reader in the iBooks app is only slightly better than nothing. 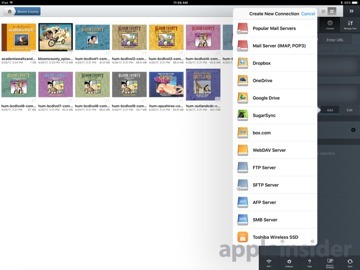 For a more full-fledged reader app, we recommend GoodReader. It's been around basically forever —we bought it before the iBookstore really took off, and we don't regret the purchase. 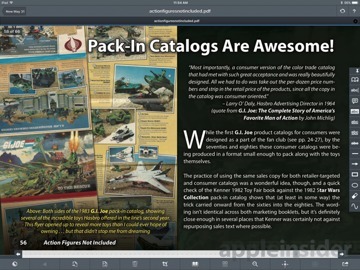 PDF annotation with the ability to read the notes on a different device, PDF export, file synchronization, local area network access, cloud access, a genuine file structure with folders, and all features of other apps that one might normally expect to have to shell out for in a series of in-app purchases are all included in the base purchase of GoodReader. When one of our authors was a child, he had a book bag loaded with game books that he'd bring with him, regardless if the trip took 30 minutes or 5 hours. Think Dungeons and Dragons, BattleTech, and Car Wars. Stores like DriveThruRPG and Steve Jackson's Warehouse 23 can fill up your digital bookbag very quickly, and give you either enough to read, or to drag your like-minded family members into a game of some sort. GoodReader costs $5, requires iOS 6.0 or newer, and occupies 64.3MB of storage space. Bring your own PDFs. 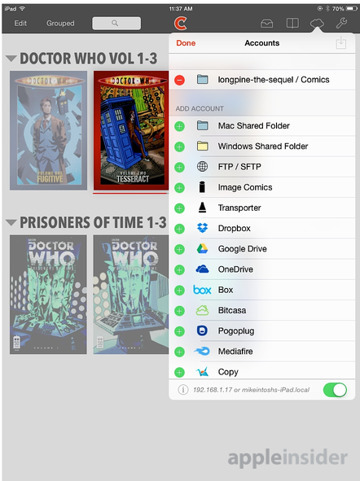 Chunky Comic Reader purports to "take the friction out of reading comics on your iPad," and in our experience, it does. 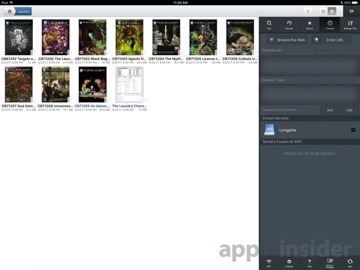 The iPad-only app has a bunch of reader-friendly features —with upscaling, contrast adjustment, and background comic downloading to make the reading experience a bit more pleasant for readers not bound to the ComiXology ecosystem. While the free version allows for a wide range of transfer options, including through iTunes, Dropbox, Google Drive, and a wide array of other storage lockers, a "pro" upgrade for $3 allows users to access a local area network and download them from file shares. 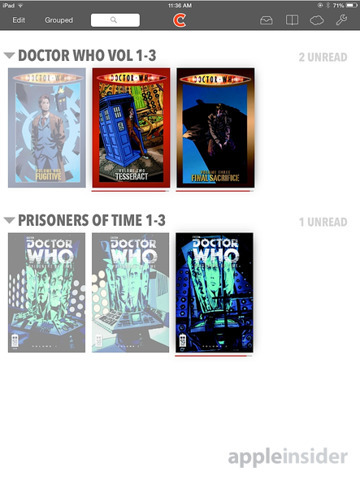 The app has all the niceties that a modern comic reader would want. Manga fans have a right-to-left reading mode; Single-page and two-page viewing modes can be enabled for comics with art spanning more than one page; parental controls can be enabled or disabled for specific comics, locking the more questionable materials from prying little eyes. No app is ever utterly perfect at what it does, but the aforementioned gorilla in ComiXology could learn a thing or two from the outstanding Chunky Comic Reader. Sure, you can subscribe to magazines piecemeal on Amazon, but there is also an all-you-can-read option in Texture. 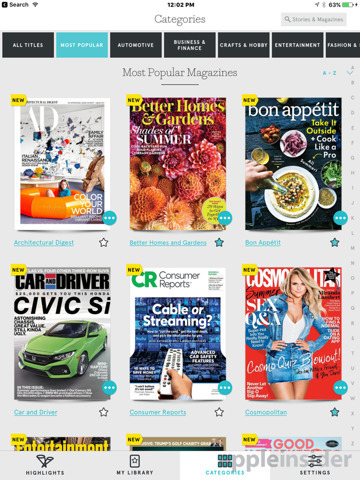 Once called Next Issue, the digital subscription service cuts down on the "pile of shame" that's probably lurking in your living room —and moves it to your iPad or iPhone. The Texture app is free, with two tiers of subscription. A $9.99 per month tier gives a choice from over 200 monthly titles, with a $14.99 giving you the monthly titles, plus some weekly ones, like People, Entertainment Weekly, Time and others. 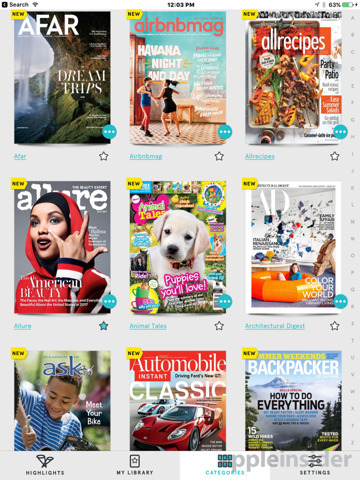 If you subscribe to more than just a handful of dead-tree based magazines, Texture is cheaper. Plus, loading them up on your iPad takes up way less space in your travel bag.